Each month a new topic with build skills in Financial Literacy, Resume building, sewing, self-esteem, car mantenance, nutritian and computer basics. 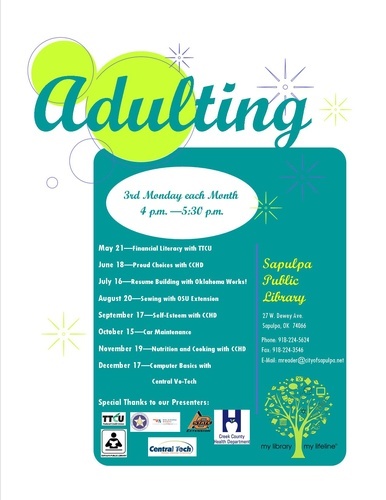 For more inforamtion contact Melody Reader at the Sapulpa Public Library. Mon. - 9 a.m. - 6 p.m.
Tues. & Wed. - 9 a.m. - 8 p.m.
Thurs. - 9 a.m. - 6 p.m.
Fri. - 9 a.m. - 5 p.m. Sat. - 10 a.m. - 2 p.m. This series will be held on the third Monday of each month from 4 to 5:30 p.m.